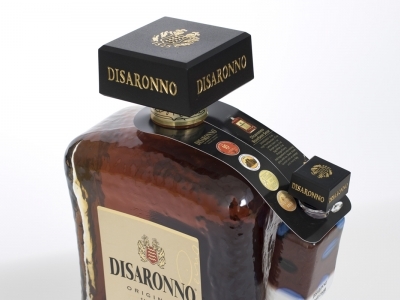 Disaronno brought a new challenge to Do-It Corporation: create a unique, printed, bottle neck hang tab to attach a 50 ml sample to its 1750 ml Disaronno Bourbon. First, the bottle neck hang tab needed to fit around the large square cap on the 1750 ml bottle. Second, it had to securely hang the 50 ml Disaronno Wears Roberto Cavalli sample. Do-It designed a bottle neck hang tab that was able to achieve both requirements. The CGM bottle neck hang tab has a long slit down the middle with a round opening at both ends. The slit is designed to allow the piece to slip over the large cap. The round openings fit around the necks of the two different sized bottles. In addition, there is a strip of adhesive under the hang tab to seal the sample in place. Tighten the two bottles together by folding and pressing the adhesive area under the tab. The attractive, digitally printed bottle neck hang tab displays a recipe for combining the two liqueurs together for a delicious Disaronno Bourbon Sour.